Applied anatomical movement can be confusing for any health-fitness professional. 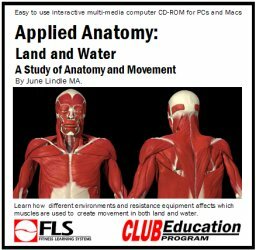 This easy to use multimedia course advances your knowledge of basic human movement, muscle use, types of contractions, and the muscle equation for both land and water environments. Deepen your understanding of concentric/eccentric action as it pertains to specific movements and equipment use on land and in water. Gain confidence in understanding the purpose of every exercise you prescribe so you can provide safe and effective programming for your group fitness and one-on-one clients. Explain and demonstrate movement in the planes and axes of motion. Identify and describe movement at the major joints in the body. Describe primary muscle actions at the major joints in the body. Identify which muscle or muscle group is responsible for a particular movement. Understand muscle actions and muscle involvement influenced by gravity on land. Understand muscle actions and muscle involvement for submerged movement. Be able to effectively use weighted, buoyed, drag, and rubberized equipment in the aquatic environment and on land, identifying muscles targeted by specific movements. Explain progressive overload principles for land and water resistance programs.